Autumn seems to be the time translations appear – a smaller crop than last year’s, but there are two publications to mention. No Man’s Land, the online journal for German writing in English, has published my translations of Arne Rautenberg – several haiku, and ‘gingko leaf fairy tale’, about coming across a pressed leaf in a copy of Grimm’s Fairy Tales. Those poems, and many more, are included in Snapdragon. 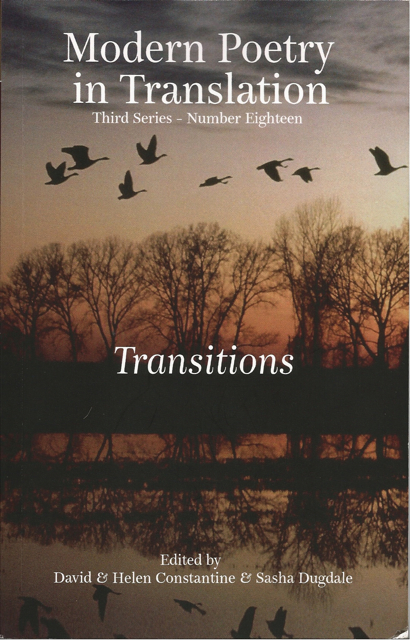 The recent issue (3:18) of Modern Poetry in Translation is on the theme of Transitions. It’s the last to be edited by David and Helen Constantine, who share this issue with their successor, Sasha Dugdale. I’ll be sad to see them go – they have consistently published work of interest from a generous range of poets and translators, and have been very supportive of my work, taking versions of Thomas Brasch, Thomas Rosenlöcher and Heiner Müller. This issue features translations of three poems by Heinz Czechowski (1935–2009), a writer I’ve just discovered this year, and who skillfully interweaves his private and public selves, the historical and the contemporary, the literary and the mundane. You can read one of the poems here. Beside them are other translations of Czechowski by Ian Hilton, a former professor of Germany at Bangor University, who has known his work for much longer than I have, and who many years ago met the poet on the eastern side of the Berlin Wall.